This possible condo with lockoff apartment has a 464 square foot apartment adjacent to an 870 square foot 2-bedroom condo. Drawn by Jacob Peters. These are also known as Junior Accessory Dwelling Units (JADU) in the California ADU laws. At the YIMBYtown conference in Boston, Massachusetts, last week, I heard from a panel comprising a developer, an architect, and a manager of special housing projects at the City of Boston. I forget who described this novel (sort of) multi-family housing configuration, but I noted it because it has benefits similar to Chicago’s coach & rear houses. There would be a residential building full of condos. Each condo would have a few bedrooms. One of the bedrooms would have its own kitchen or kitchenette, bathroom, and direct entry to the building’s corridor. The bedroom would be “locked off” from the rest of the condo. The condo owner would rent the bedroom to a tenant, providing them housing that would most likely be less costly than an equivalent (new construction) apartment. As the condo owner’s household changes – perhaps the family has another child – the tenant can move out and the owner can remove the kitchen to create another bedroom or closet. Lock offs are heavily also present in time shares. The zoning question is whether this condo is treated as one unit or two. If you’re trying to increase affordable housing in your municipality, it’s necessary to classify this condo configuration as a single unit. Anything more and it wouldn’t be possible to build any of these, as the building developer would run into minimum lot area per unit and FAR limitations. My friend Jacob Peters quickly drew a floor plan for what a lockoff condo would look like. Update: I’m happy to see that Lennar, one of the most prolific home builders in the United States, has included the lock-off apartment in their “Next Gen” house design. A sample floor plan is below. Sample floor plans of Lennar’s Next Gen suburban single-family house with lock-off apartment. Blue Line going down into the subway towards the Logan Square station. This shot was slightly difficult because there are two controls on the remote control that I have to handle with the same hand: The first was the camera tilt and the second was the rotation. I think I can move the camera tilt function to the other dial. I only tried this shot twice, and this was the second one. It’s not perfect; there’s a hiccup after the rotation has finished and I didn’t tilt the camera up as soon as I would have liked. The hot air balloon I used to get this shot is the DJI Mavic Pro. Which Chicago buildings have the worst energy efficiency? About five years ago (I’m too lazy to look it up right now), the City of Chicago adopted an energy benchmarking law. This means that owners of buildings of a certain size would soon be required to report how much energy (electricity, natural gas, district steam, chilled water, and other fuels) their buildings use. Every few years they have to audit their reports. The city has posted three years of energy reports for the “covered” buildings (the ones of a certain size) on its data portal. 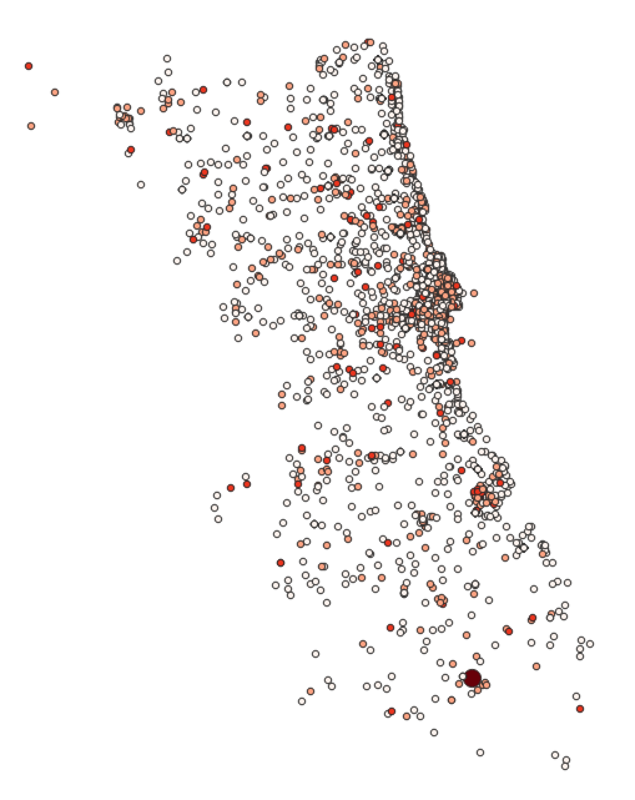 I copied the Chicago Energy Benchmarking dataset into the Chicago Cityscape database (for future features) and then loaded it into QGIS so I could analyze the data and find the least efficient buildings in Chicago. The dataset has all three years so I started the analysis by filtering only for the latest year, 2016. I first visualized the data using the “ghg_intensity_kg_co2e_sq_ft” column, which is “greenhouse gas intensity, measured in kilograms of carbon dioxide equivalent per square foot”. In other words, how much carbon does the building cause to be emitted based on its energy usage and normalized by its size. In QGIS, to symbolize this kind of quantitative data, it helps to show them in groups. Here are “small fry” emitters, medium emitters, and bad emitters. I used the “Graduated” option in the Symbology setting and chose the Natural Breaks (Jenks) mode of dividing the greenhouse gas intensity values into four groups. There are four groups, divided using the Natural Breaks (Jenks) method. There’s only one building in the “worst” energy users group, which is Salem Baptist Church, marked by a large red dot. The darker red the dot, the more energy per square foot that building consumes. Among the four groups, only one building in Chicago that reported in 2016 was in the “worst emitters” group: Salem Baptist Church of Chicago at 10909 S Cottage Grove Avenue in Pullman. The next “worse” emitter in the same “Worship Facility” category as Salem Baptist Church is several magnitudes of order lower. That’s St. Peter’s Church at 110 W Madison Street in the Loop, built in 1900, which emits 11.7 kilograms of carbon dioxide equivalent per square foot (but which also has an Energy Star rating of 1). The vast difference is concerning: Did the church report its energy usage correctly, or are they not maintaining their HVAC equipment or the building and it’s leaking so much air? A different building was in the “worst” emitter category in 2015 but improved something about the building by 2016 to use a lot less energy. Looking deeper at the data for Piper’s Alley, however, something else happened. In 2015, Piper’s Alley reported a single building with 137,176 gross square feet of floor area. The building’s owner also reported 5,869,902 kBTUs of electricity usage and 1,099,712,681 kBTUs of natural gas usage. Since these are reported in kilo-BTUs that means that you multiply each number by 1,000. Piper’s Alley reported using 1 trillion BTUs of natural gas. Which seems like an insane amount of energy usage, but could be totally reasonable – I’m not familiar with data on how much energy a “typical” large building uses. Piper’s Alley in Old Town is the building that reported two different floor areas and vastly different energy usage in 2015 and 2016. The building’s owner didn’t report data for 2014 (although it may not have been required to). There’s another problem with the reporting for Piper’s Alley, however: For 2016, it reported a gross floor area of 217,250 square feet, which is 36 percent larger than the area it reported in 2015. The building reported using significantly more electricity (58 percent more) and significantly less natural gas (137 percent less), for a vastly lowered kgco2esf value. I think the energy benchmarking data set needs more eyes on it. Discuss in the comments below, or reply to my Twitter thread. “We need the right land use policies, so around things like parking minimums, which are catastrophic, around things like height rules around transit nodes, around things like the way that bike lanes operate, and the design of roads that kind of allow for 35 mph and not 25 mph…all that stuff that we know is a disincentive to walking and cycling, is embedded in our municipal land use policies. “What the state should do is not just increase investment in mass transit, but then condition that investment on municipal polices that encourage the kind of mixed-use development, transit-oriented development, walkability, bikeability. Need help voting? Check out my crowdsourced voting guide for friends! Don’t know who to vote for? Start your research using my friends voter guide! Anyone can read it and comment, only the invited few can edit. If you would like to make some edits, ask for an invitation. The primary election is on March 20, but early voting in Cook County has begun. Anyone registered in Cook County can vote early at multiple sites, including the downtown hub at 16 W Adams. Voting here is quick because they have so many voting booths. Get all the other details on early voting.